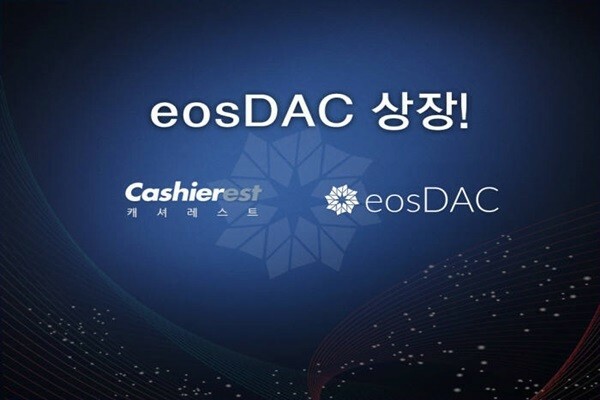 A South Korean cryptocurrency exchange called Cashierest (CEO Park Won-joon) made an announcement that it is going to be the first South Korean exchange to list eosDAC. It is expected to be listed at 3 P.M. on the 10th. While EOS is a token based on Ethereum (ERC-20) and has its blocks created by 21 BPs (Block Producer), eosDAC allows token holders to participate in maintenance and operation of its ecosystem. eosDAC is planning to pay 75% of entire issued amount through airdrop. eosDAC’s goal is to vitalize EOS platform by creating dApp and Smart Contract that are necessary to provide services. BLOCKMAKER is the one that issues eosDAC, which is operated in a different from GAS paid by NEO. On the other hand, Cashierest is planning to support members who had EOS at 10 A.M. of the 15th of April, which is EOS snapshot time, with AirDrop of eosDAC.